Cruise Q&A: How do I distinguish between cruise lines? Would-be cruisers can be bewildered by the number of cruise lines out there. At first glance, it’s hard to know whether Carnival, Celebrity, or Radisson would be the best choice for your interests and budget. Luckily, industry experts have divided most of the major cruise lines into three categories: mainstream, premium, and luxury. Once you know which cruising experiences go with each category and which lines fall into such categories, you’ll better be able to narrow down your search for the perfect sailing. What is a mainstream cruise? Often referred to as resort, contemporary, or mass-market cruises, these ships provide an experience similar to that of a resort. The hallmarks of the mainstream cruise lines are large ships and plentiful activities. The ships usually hold 1,000 to 3,000 guests, and because of the sheer number of people, you may find smaller standard cabins, long lines, and acceptable (but not amazing) service. On the plus side, these ships offer an incredible number of activities. “Anything they can think of to put on a ship, they do,” says Mike Wild, vice president of industry affairs for Cruise Planners in Coral Springs, FL. “You can do everything from napkin folding to ice carving to climbing a wall.” Ships can have multiple pools, waterslides, ice skating rinks, rock-climbing walls, and several lounges and dance clubs. Mainstream cruises also are the best for families with children, as the ships include children- and teen-specific lounges and activities. Mainstream cruises tend to cost $100 to $350 per person per day. Mainstream lines include Carnival, Costa, Disney, Norwegian, and Royal Caribbean. What is a premium cruise? Premium cruises offer many of the activities of a mainstream line, but with more upscale amenities and service. Ships range from mid-sized to large, holding between 500 and 1,500 guests. Staterooms will be slightly more spacious than in mainstream ships, food will be more gourmet, and the decor more elegant or conservative. You’ll have plenty of choices for activities, but without the summer camp sensibility that mainstream cruises have. Children are welcome, but facilities won’t be as extensive as on the mainstream ships. Premium cruises tend to cost $150 to $400 per person per day. Premium lines include Celebrity, Holland America, Princess, and Oceania. 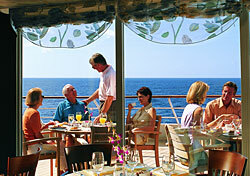 Luxury cruises offer the utmost in personalized service. Ships to tend to be smaller, holding from 100 to 1,000 passengers, but staterooms tend to be bigger and often all cabins are suites or have balconies. The space to guest ratio is high and the staff to guest ratio is often two to one, leading to excellent service. Amenities will be high quality, with many little touches such as designer linens and bath products and fresh flowers. Alcoholic beverages and gratuities are often included in the cruise price, as opposed to mainstream and premium cruises. The itineraries tend to include more exotic and international destinations, and cruise lengths are longer, anywhere from seven days to several-month world cruises. Ship activities are confined to guest lecturers and cooking demonstrations, art auctions, and other refined pasttimes; you usually won’t find loud, all-night discos or bingo competitions on a luxury sailing. Luxury cruises tend to cost $400 to $1,000 per person per day. Luxury lines include Crystal, Radisson Seven Seas, Seabourn, and Silversea. Which type of cruise is right for me? In most cases, the type of cruise you choose may be limited to your budget. However, if money is no object, you should choose a mainstream cruise if you like constant and varied activities, want to interact with a lot of people, and have active children. You should choose a luxury line if you prefer to be pampered with service, dine on gourmet food, visit exotic destinations, or spend a lot of time relaxing in your cabin or on deck. If you want a choice of activities with a more refined atmosphere, go for the premium cruise.